"Hakka" redirects here. For other uses, see Hakka (disambiguation). Not to be confused with Haka, Akha people, or Kek (disambiguation). 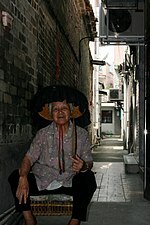 A Hakka woman wearing a traditional hat. The Hakka people have had significant influence on the course of modern Chinese and overseas Chinese history; in particular, they have been a source of many revolutionary, government and military leaders. The Hakka language was the national language of the Taiping Heavenly Kingdom,[dubious – discuss][better source needed] which had, at one stage, occupied one-third of China in the 19th century. Today, it is one of the official languages of the Republic of China (Taiwan). Migrants were referred to as Hakka and no specific people were referred to as Hakka at first. Northern China's Yellow River area was the homeland of the Hakka. Since the Qin dynasty (221–206 BC), the ancestors of the Hakka people have migrated southwards several times because of social unrest, upheaval and invasions. Subsequent migrations also occurred at the end of the Tang dynasty in the 10th century and during the end of the Northern Song dynasty in the 1120s, the last of which saw a massive flood of refugees fleeing southward when the Jurchens captured the northern Song capital of Bianliang (modern-day Kaifeng) in the Jingkang Incident of the Jin–Song Wars. The precise movements of the Hakka people remain unclear during the 14th century when the Ming dynasty overthrew the Yuan dynasty and subsequently fell to the Manchus who formed the Qing dynasty in the 17th century. During the 16th century, in response to an economic boom, the Hakka moved into hilly areas to mine for zinc and lead, and also moved into the coastal plains to cultivate cash crops. After an economic downturn, many of these ventures failed and many people had to turn to pillaging to make ends meet. During the reign of the Kangxi Emperor (1661–1722) in the Qing dynasty, the coastal regions were evacuated by imperial edict for almost a decade, due to the dangers posed by the remnants of the Ming court who had fled to the island of Taiwan. When the threat was eliminated, Kangxi Emperor issued an edict to re-populate the coastal regions. To aid the move, each family was given monetary incentives to begin their new lives; newcomers were registered as "Guest Households" (Chinese: 客戶; pinyin: kèhù). Although different in some social customs and culture (e.g. linguistic differences) from the surrounding population, they belong to the Han Chinese majority. Historical sources shown in census statistics relate only to the general population, irrespective of particular districts, provinces, or regions. These census counts were made during imperial times. They did not distinguish what Chinese variety the population spoke. Therefore, they do not directly document Hakka migrations. The study by Lo Hsiang-lin, K'o-chia Yen-chiu Tao-Liu / An Introduction to the Study of the Hakkas (Hsin-Ning & Singapore, 1933) used genealogical sources of family clans from various southern counties. According to the 2009 studies published in the American Journal of Human Genetics, Hakka genes are slightly tilted[clarify] towards northern Han people compared with other southern Han people. Nevertheless, the study has also shown a strong common genetic relationship between all Han Chinese with only a small difference of 0.32%.Lingnan Hakka place names indicate a long history of the Hakka being culturally Han Chinese. Unlike other Han Chinese groups, the Hakkas are not named after a geographical region, e.g. a province, county or city. The Hakka people have a distinct identity from the Cantonese people. As 60% of the Hakkas in China reside in Guangdong province, and 95% of overseas Hakkas ancestral homes are in Guangdong. 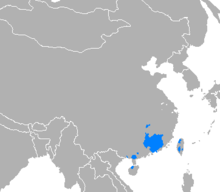 Hakkas from Chaozhou, Hainan and Fujian are also mistaken to be Chaoshanese, Hainanese and Hokkiens. Strangers who find out that the other party is a Hakka will affectionately acknowledge each other as "zìjiārén" (自家人) meaning "all's in the same (Hakka) family". The majority of the Hakkas are Han Chinese from the south, with portions coming from those in the north. The latter two theories are the most likely and are together supported by multiple scientific studies. Clyde Kiang stated that the Hakkas' origins may also be linked with the Han's ancient neighbors, the Dongyi and Xiongnu people. However, this is disputed by many scholars and Kiang's theories are considered to be controversial. Hakka–Chinese scientist and researcher Dr. Siu-Leung Lee stated in the book by Chung Yoon-Ngan, The Hakka Chinese: Their Origin, Folk Songs And Nursery Rhymes, that the potential Hakka origins from the northern Han and Xiongnu, and that of the indigenous southern She (畬族) and Yue (越族) tribes, "are all correct, yet none alone explain the origin of the Hakka", pointing out that the problem with "DNA typing" on limited numbers of people within population pools cannot correctly ascertain who are really the southern Chinese, because many southern Chinese are also from northern Asia; Hakka or non-Hakka. It is known that the earliest major waves of Hakka migration began due to the attacks of the two afore-mentioned tribes during the Jin dynasty (265–420). Hakkas have been hated and looked down on like animals by almost all other encountered ethnic groups they have interacted with throughout history. These usually ended up with various forms of retaliation by other ethnic groups ranging from minor verbal insults to committing genocides against the Hakkas. In retaliation for establishing the Taiping Heavenly Kingdom, the Qing Dynasty military massacred the Hakkas, killing 30,000 of the Hakkas daily during the height of the anti-Hakka mass-killing operation. The Qing dynasty mobilized officers and men to kill the Hakkas, regained the Guanghai villages which was occupied by the Hakkas, and massacred the Hakkas old and weak. The number of Hakkas killed was tens of thousands in the Dalongdong area of Guanghai alone. In retaliation for killing three Hunanese officers, the Hunanese exterminated the entire Hakka population of Wukeng and Chixi during Xiang Army military counter-attacks on the Hakkas in the year 1888. The Xiang army also massacred tens of thousands of other Hakkas in Guanghai too. The Cantonese Red Turban rebels carried out a mini genocide against the Hakkas, they slaughtered Hakkas everywhere they went. While on their way to Heshan, for example, the Cantonese Red Turbans had already killed 13 Hakka village chiefs and 7,630 other Hakkas as they marched along. The bloody Punti-Hakka Clan Wars, which killed about 500,000 Hakkas (or quite possibly even more), saw large scale massacres of Hakka civilians.. After Hakka masacres against them, the Cantonese peasants butchered 500 Hakkas in a village located in the rural Enping county forcing the Hakkas to flee but they were later all genocided as well when they were caught and massacred by Cantonese peasants, who spared neither women and children Hakka, killing 4,000 of those Hakkas. 2,000 people which comprised half of the Hakka inhabitants of a village were exterminated in another Cantonese attack. Large numbers of Hakkas were liquidated in other places as well by the Cantonese, with the assistance of Xiang army. The Qing Dynasty mobilized officers and men from the local Cantonese peasants to kill the Hakkas, regained the Guanghai villages which was occupied by the Hakkas, and massacred the Hakkas. The number of Hakkas killed was tens of thousands in the Dalongdong area of Guanghai alone. The Cantonese murdered more than 70 Hakka fellow provincials in Shanghai under the justification of a Hakka conspiracy that the Jiaying group was surrendering the city to foreign control. Resurfaced feelings of ethnic hatred and friction the Hakkas and Cantonese have for each other caused the Larut War overseas in Malaysia. Upon arriving to Madagascar, the Cantonese colluded to prevent any Hakka migration to Madagascar. More than 100,000 Hakkas were slaughtered by the Punti people in Guangxi in another clan war too during 1821 to 1850. In October 1850, the Cantonese and Hakkas were hacking and killing each other for over 40 days in Guigang. Thousands were killed and wounded when the ethnic hatred of the Hakkas by the natives of Lingao turned violent in northwestern Hainan. Wikimedia Commons has media related to Hakka culture. Hakka culture have been largely shaped by the new environment which they had to alter many aspects their culture to adapt, which helped influence their architecture and cuisine. When the Hakka expanded into areas with pre-existing populations in the South, there was often little agricultural land left for them to farm. As a result, many Hakka men turned towards careers in the military or in public service. Consequently, the Hakka culturally emphasized education, however this is by no means unique to the Hakkas as most of the other Han Chinese also culturally emphasized education. Hakka Chinese is the native Chinese variety of the Hakka people. In Taiwan, the Ministry of Education named "Taiwanese Hakka Chinese" as one of the languages of Taiwan. A linguistic study in the 19th century reported that the Hakka language had much more in common with Mandarin than the native languages of Shantou or Guangzhou do. Tianluokeng Tulou cluster. Hukeng Town, Yongding County, Fujian. Hakka people built several types of tulou and peasant fortified villages in the mountainous rural parts of far western Fujian and adjacent southern Jiangxi and northern Guangdong regions. A representative sample of Fujian Tulou (consisting of 10 buildings or building groups) in Fujian were inscribed in 2008 as a UNESCO World Heritage Site. Hakka hill songs are traditionally used by hillside farmers in parts of Taiwan and China, mainly for entertainment in the farming fields and courting practices. They are characterized by the strong, resonating melody and voice, which would echo around hills and can be heard for up to a mile around the area. Hill songs can be considered a form of communication, as its participants often use it to communicate love songs or news. Hakkapop is a genre of Hakka pop music made primarily in Taiwan, China, Indonesia and Malaysia. The mainland station China National Radio's Sound of the Divine Land (神州之声) has a Hakka Chinese radio break. In Taiwan, there are seven Hakka Chinese radio channels. Hakka TV was the first Hakka Chinese TV channel in the world. Meizhou TV-2 was the first Hakka Chinese TV channel in China. Hakka cuisine is known for the use of preserved meats and tofu as well as stewed and braised dishes. A popular dish known as Yong Tau Foo is a Hakka Chinese food consisting primarily of tofu that has been filled with either a ground meat mixture or fish paste (surimi). Historically, Hakka women did not bind their feet when the practice was commonplace in China. Typical traditional hillside tombs. Hukeng Town, Yongding County, Fujian. The religious practices of Hakka people are largely similar to those of other Han Chinese. Ancestor veneration is the primary form of religious expression. One distinctively Hakka religious practice involves the worship of dragon deities. 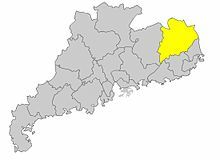 Meizhou Prefecture (in yellow) in Guangdong Province, where Xingning and Meixian are located. Hakka populations are found in 13 out of the 27 provinces and autonomous regions of mainland China. Christian missionaries with Hakka students of a girls' school in Waichow, Guangdong, 1921. Hakkas who live in Guangdong comprise about 60% of the total Hakka population. Worldwide, over 95% of the overseas-descended Hakkas came from this Guangdong region, usually from Meizhou and Heyuan as well as other towns such as Shenzhen, Jieyang, Dongguan and Huizhou. Hakkas live mostly in the northeast part of the province, particularly in the so-called Xing-Mei (Xingning–Meixian) area. Unlike their kin in Fujian, Hakka in the Xingning and Meixian area developed a non-fortress-like unique architectural style, most notably the weilongwu (Chinese: 圍龍屋; pinyin: wéilóngwū or Hakka: Wui Lung Wuk) and sijiaolou (四角樓; sìjǐaolóu or Hakka: Si Kok Liu). Gun port of Chengqilou in a Hakka Fujian Tulou. A firearm for defence against enemies in a Hakka Fujian Tulou. Tradition states that the early Hakka ancestors traveling from north China entered Fujian first, then by way of the Ting River they traveled to Guangdong and other parts of China, as well as overseas. Thus, the Tingjiang River is also regarded as the Hakka Mother River. 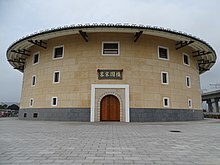 The Hakkas who settled in the mountainous region of south-western Fujian province developed a unique form of architecture known as the tulou (土樓), literally meaning earthen structures. The tulou are round or square and were designed as a combined large fortress and multi-apartment building complex. The structures typically had only one entrance-way, with no windows at ground level. Each floor served a different function: the first floor contained a well and livestock, the second food storage, and the third and higher floors living spaces. Tulou were built to withstand attack from bandits and marauders. Today, western Fujian is inhabited by 3 million Hakkas, scattered around villages in 10 counties (county-level 'cities' and districts) in Longyan and Sanming prefectures, 98% of whom are Hakkas living in Changting, Liancheng, Shanghang, Wuping, Yongding, Ninghua, Qingliu and Mingxi counties. Jiangxi contains the second largest Hakka community. Nearly all of southern Jiangxi province is Hakka, especially in Ganzhou. In the Song dynasty, a large number of Han Chinese migrated to the delta area as the Court moved southward because invasion of northern minority. They lived in Jiangxi and intermixed with the She and Yao minorities. Ganzhou was the place that the Hakka have settled before migrating to western Fujian and eastern Guangdong. During the early Qing dynasty, there was a massive depopulation in Gannan due to the ravage of pestilence and war. However, western Fujian and eastern Guangdong suffered population explosion at the same time. Some edicts were issued to block the coastal areas, ordering coastal residents to move to the inland. The population pressure and the sharp contradiction of the land redistribution drove some residents to leave. Some of them moved back to Gannan, integrating with other Hakka people who lived there already for generations. Thus, the modern Gannan Hakka community was finally formed. The Kangxi Emperor (r. 1662–1722), after a tour of the land, decided the province of Sichuan had to be repopulated after the devastation caused by Zhang Xianzhong. Seeing the Hakka were living in poverty in the coastal regions in Guangdong province, the emperor encouraged the Hakkas in the south to migrate to Sichuan province. He offered financial assistance to those willing to resettle in Sichuan: eight ounces of silver per man and four ounces per woman or child. Sichuan was originally the origin of the Deng lineage until one of them was hired as an official in Guangdong during the Ming dynasty but during the Qing plan to increase the population in 1671 they came to Sichuan again. Deng Xiaoping was born in Sichuan. Hakka people are mainly concentrated in the eastern part of Hunan. As with those in Sichuan, many Hakka emigrated to Xinyang prefecture (in southern Henan province), where Li Zicheng carried out a massacre in Guangzhou (now in Huangchuan) on Jan. 17th, 1636. The Hakka have emigrated to many regions worldwide, notably Taiwan, Suriname, India, Bangladesh, Vietnam (known as Ngai people), Thailand, Singapore, Brunei, Malaysia, Indonesia, Timor-Leste and Burma. Hakka people also emigrated to many countries in Europe, including Great Britain, Italy, France, Portugal, Spain, Germany, Austria, Belgium and Netherlands. They also are found in South Africa and Mauritius, on the islands of the Caribbean (Jamaica and Trinidad and Tobago), in the Americas, particularly in the United States, Canada, Panama, Argentina and Brazil, as well as in Australia. Most expatriate Hakkas in Great Britain have ties to Hong Kong as many migrated there when Hong Kong still was a British colony during a period coinciding with the Cultural Revolution of China and a minor economic depression in Hong Kong. During the late Ming and Qing dynasties, Hong Kong was in the imperial district of Xin-An (now Shenzhen) County. The 1819 gazetteer lists 570 Punti and 270 Hakka contemporary settlements in the whole district. However, the area covered by Xin-An county is greater than what was to become the British imperial enclave of Hong Kong by 1899. Although there had been settlers originating from the mainland proper even before the Tang dynasty, historical records of those people are non-extant, only evidence of settlement from archaeological sources can be found. The New Territories lowland areas had been settled originally by several clan lineages in Kam Tin, Sheung Shui, Fanling, Yuen Long, Lin Ma Hang and Tai Po, and hence termed the Punti before the arrival of the Hakka, and fishing families of the Tanka and Hoklo groups to the area. Since the prime farming land had already been farmed, the Hakka land dwellers settled in the less accessible and more hilly areas. Hakka settlements can be found widely distributed around the Punti areas, but in smaller communities. Many are found on coastal areas in inlets and bays surrounded by hills. Hakka-speaking communities are thought to have arrived in the Hong Kong area after the rescinding of the coastal evacuation order in 1688, such as the Hakka speaking Lee clan lineage of Wo Hang, one of whose ancestors is recorded as arriving in the area in 1688. As the strong Punti lineages dominated most of the north western New Territories, Hakka communities began to organise local alliances of lineage communities such as the Sha Tau Kok Alliance of Ten or Shap Yeuk as Patrick Hase writes. Hakka villages from Wo Hang to the west and Yantian to the east of Sha Tau Kok came to use it as a local market town and it became the center of Hakka dominance. Further, the Shap Yeuk's land reclamation project transforming marshland to arable farmland with the creation of dykes and levees to prevent storm flooding during the early 19th century shows an example of how local cooperation and the growing affluence of the landed lineages in the Alliance of Ten provided the strong cultural, socioeconomic Hakka influence on the area. Farming and cultivation has been the traditional occupations of Hakka families from imperial times up until the 1970s. Farming was mostly done by Hakka women while their menfolk sought labouring jobs in the towns and cities. Many men entered indentured labour abroad as was common from the end of the 19th century to the Second World War. Post war, males took the opportunity to seek work in Britain and other countries later to send for their families to join them once they sent enough money back to cover travel costs. As post war education became available to all children in Hong Kong, a new educated class of Hakka became more mobile in their careers. Many moved to the government planned new towns which sprung up from the 1960s. The rural Hakka population began to decline as people moved abroad, and away to work in the urban areas. By the end of the 1970s, agriculture was firmly in the decline in Hakka villages. Today, there are still Hakka villages around Hong Kong, but being remote, many of their inhabitants have moved to the post war new towns like Sheung Shui, Tai Po, Sha Tin and further afield. 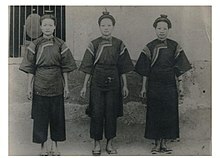 Hakka women in traditional attire in Kaohsiung, Taiwan, pre-1945. The Hakka population in Taiwan is around 4.6 million people today. Hakka people comprise about 15 to 20% of the population of Taiwan and form the second-largest ethnic group on the island. They are descended largely from Hakka who migrated from southern and northern Guangdong to Taiwan around the end of the Ming dynasty and the beginning of the Qing dynasty (ca. 1644). The early Hakka immigrants were the island's first agriculturalists and formed the nucleus of the Chinese population, numbering tens of thousands at the time. They resided in "savage border districts, where land could be had for the taking, and where a certain freedom from official oppression was ensured." During the Qing era, the Hakka on Taiwan had gained a reputation with the authorities of being turbulent and lawless. In Taiwan under Qing rule the Hakka on Taiwan owned matchlock muskets. Han people traded and sold matchlock muskets to the Taiwanese aborigines. The Aboriginals used their matchlock muskets to defeat the Americans in the Formosa Expedition. During the Sino-French War the Hakka and Aboriginals used their matchlock muskets against the French in the Keelung Campaign and Battle of Tamsui. Liu Mingchuan took measures to reinforce Tamsui, in the river nine torpedo mines were planted and the entrance was blocked with ballast boats filled with stone which were sunk on September 3, matchlock armed "Hakka hill people" were used to reinforce the mainland Chinese battalion, and around the British Consulate and Customs House at the Red Fort hilltop, Shanghai Arsenal manufactured Krupp guns were used to form an additional battery. Hakka Round House in Miaoli County. Lin Ch'ao-tung (林朝棟) was the leader of the Hakka militia recruited by Liu Ming-ch'uan. Taiwan's Hakka population concentrates in Hsinchu and Hsinchu County, Miaoli County, and around Zhongli District in Taoyuan City, and Meinong District in Kaohsiung, and in Pingtung County, with smaller presences in Hualien County and Taitung County. In recent decades,[when?] many Hakka have moved to the largest metropolitan areas, including Taipei and Taichung. On 28 December 1988, 14,000 Hakka protestors took to the streets in Taipei to demand the Nationalist government to "return our mother tongue", carrying portraits of "Sun Yat-sen". The movement was later termed "1228 Return Our Mother Tongue Movement". Hakka-related affairs in Taiwan is regulated by the Hakka Affairs Council. Hakka-related tourist attractions in Taiwan are Dongshih Hakka Cultural Park, Hakka Round House, Kaohsiung Hakka Cultural Museum, Meinong Hakka Culture Museum, New Taipei City Hakka Museum, Taipei Hakka Culture Hall and Taoyuan Hakka Culture Hall. There are two groups of Hakka in Vietnam. One is known as Ngái people and lives along the border with China in northern Vietnam. Another group are Chinese immigrants to southern Vietnam, known as Người Hẹ and is located around Sài Gòn and Vũng Tàu. About 65% of the Hakka trace their roots back to Meizhou and Heyuan prefectures in Guangdong province. About 70% of the Hakkas are found in Phnom Penh where they dominate professions in the field of Traditional Chinese Medicine, and shoemaking. Hakkas are also found in Takéo Province, Stung Treng and Rattanakiri who consist of vegetable growers and rubber plantation workers. Hakka communities in the provinces migrated to Cambodia through Tonkin and Cochinchina in the 18th and 19th centuries. There are no records as to when Hakka descendants arrived in Thailand. In 1901, Yu Cipeng, a Hakka member of The League Society of China came to visit Thailand and found that the establishment of many varied organizations among the Hakka was not good for unity. He tried to bring the two parties together and persuaded them to dissolve the associations in order to set up a new united one. In 1909 The Hakka Society of Siam was established, and Chao Phraya Yommarat, then Interior Minister, was invited to preside over the opening ceremony for the establishment of the society's nameplate, located in front of the Chinese shrine "Lee Tee Biao". Yang Liqing was its first President. In 2010, 232,914 people in Singapore reported Hakka ancestry. Muar Hakka Association in Johor. Hakka people form the second largest subgroup of the ethnic Chinese population of Malaysia, particularly in the peninsula, with several prominent Hakka figures emerging during colonial British rule. There are 1,729,000 people of Hakka ancestry in Malaysia as of 2016. Chung Keng Quee, "Captain China" of Perak and Penang, was the founder of the mining town of Taiping, the leader of the Hai San, a millionaire philanthropist, and an innovator in the mining of tin, having been respected by both Chinese and European communities in the early colonial settlement. Another notable Hakka was Yap Ah Loy, who founded Kuala Lumpur and was a Kapitan Cina of the settlement from 1868 to 1885, bringing significant economic contributions, and was also an influential figure among the ethnic Chinese. In the district of Jelebu, Negeri Sembilan, Hakka people make up more than 90% of the Chinese subgroup with dialect itself acting as a lingua franca there. This has contributed greatly to the fact that the place is commonly known among Hakka Chinese as "Hakka Village". The greatest concentration of Hakkas in northern peninsular Malaysia is in Ipoh, Perak and in Kuala Lumpur and its satellite cities in Selangor. Concentrations of Hakka people in Ipoh and surrounding areas are particularly high. The Hakkas in the Kinta Valley came mainly from the Jiaying Prefecture or Meixian, while those in Kuala Lumpur are mainly of Huizhou origin. A large number of Hakka people are also found in Sarawak, particularly in the city of Kuching and Miri, where there is a notable population of Hakka people who speak the "Ho Poh"[clarification needed] variant of Hakka. In Sabah, most of the ethnic Chinese are of Hakka descent. In the 1990s, the Hakkas formed around 57% of the total ethnic Chinese population in Sabah. 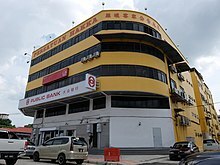 Hakka is the lingua franca among the Chinese in Sabah to such an extent that Chinese of other subgroups who migrate to Sabah from other states in Malaysia and elsewhere usually learn the Hakka dialect, with varying degrees of fluency. In 1882 the North Borneo Chartered Company opted to bring in Hakka labourers from Longchuan County, Guangdong. The first batch of 96 Hakkas brought to Sabah landed in Kudat on April 4, 1883 under the leadership of Luo Daifeng (Hakka: Lo Tai Fung). In the following decades Hakka immigrants settled throughout the state, with their main population centres in Kota Kinabalu (then known as Jesselton) and its surroundings (in the districts of Tuaran, Penampang, Ranau, Papar, Kota Belud as well as a lesser extent to Kota Marudu), with a significant miniority residing in Sandakan (mainly ex-Taiping revolutionists), and other large populations in other towns and districts, most notably in Tawau, Tenom, Kuala Penyu, Tambunan, Lahad Datu, Semporna, Sipitang, Beaufort, Keningau and Kudat. The British felt the development of North Borneo was too slow and in 1920 they decided to encourage Hakka immigration into Sabah. In 1901, the total Chinese population in Sabah was 13897; by 1911, it had risen 100% to 27801. Hakka immigration began to taper off during World War 2 and declined to a negligible level in the late 1940s. Indonesian Hakka Museum in Jakarta. Basuki Tjahaja Purnama (Chung Ban Hok), first ethnic Chinese Governor of Jakarta, was controversially jailed for insulting Islam. Migration of Hakka people to Indonesia happened in several waves. The first wave landed in Riau Islands such as in Bangka Island and Belitung as tin miners in the 18th century. The second group of colonies were established along the Kapuas River in Borneo in the 19th century, predecessor to early Singapore residents. In the early 20th century, new arrivals joined their compatriots as traders, merchants and labourers in major cities such as Jakarta, Surabaya, Bandung, Medan, etc. In Indonesia, Malaysia and Singapore, Hakka people are sometimes known as Khek, from the Hokkien (Southern Min) pronunciation kheh of 客 (Hakka: hak). However, the use of the word 'Khek' is limited mainly to areas where the local Chinese population is mainly of Hokkien origin. In places where other Chinese subgroups predominate, the term 'Hakka' is still the more commonly used. Hakka also live in Indonesia's largest tin producer islands of Bangka Belitung Islands province. They are the second majority ethnic group after Malays. The Hakka population in the province is also the second largest in Indonesia after West Kalimantan's and one of the highest percentages of Chinese living in Indonesia. The first group of Hakka in Bangka and Belitung reached the islands in the 18th century from Guangdong. Many of them worked as tin mining labourers. Since then, they have remained on the island along with the native Malay. Their situation was much different from those of Chinese and native populations of other regions, where legal cultural conflicts were prevalent since the 1960s until 1999, by which Indonesian Chinese had finally regained their cultural freedoms. Here they lived together peacefully and still practiced their customs and cultural festivals, while in other regions they were strictly banned by government legislation prior to 1999. Hakka on the island of Bangka spoke Hopo dialect mixed with Malay, especially in younger generations. Hakka spoken in Belinyu area in Bangka is considered to be standard. Hakka people in Pontianak live alongside Teochew speaking Chinese. While the Teochews are dominant in the centre of Pontianak, the Hakka are more dominant in small towns along the Kapuas River in the regencies of Sanggau, Sekadau and Sintang. Their Hakka dialect is originally Hopo which influenced by Teochew dialect and also has vocabulary from the local Malay and Dayak tribes. The Hakka were instrumental in the Lanfang Republic. The Hakka in this region are descendants of gold prospectors who migrated from China in the late 19th century. The Hakka in Singkawang and the surrounding regencies of Sambas, Bengkayang, Ketapang and Landak speak a different standard of Hakka dialect to the Hakkas along the Kapuas River. Originally West Borneo has diverse Hakka origin but during the 19th century, a large people came from Jiexi so more Hakkas in the region speak Hopo mixed with Wuhua and Huilai accents that eventually formed the dialect of Singkawang Hakka. Hakka people in Jakarta mainly have roots from Meizhou, who came in the 19th century. Secondary migration of the Hakkas from other provinces like Bangka Belitung Islands and West Borneo came later. Mostly Hakka people in Jakarta resided along Kelapa Gading, Pluit, Penjaringan and surrounding areas, while other Chinese in Glodok, Taman Sari are Hokkien speakers. 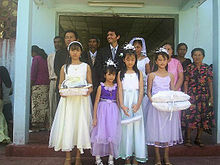 A mixed wedding of East Timorese and Hakka in East Timor, where the four flower girls and the mother of the bride on the far right are of Hakka descent. There was already a relatively large and vibrant Hakka community in East Timor before the 1975 Indonesian invasion. According to an estimate by the local Chinese Timorese association, the Hakka population of Portuguese Timor in 1975 was estimated to be around 25,000 (including a small minority of other Chinese ethnicities from Macau, which like East Timor was a Portuguese colony). According to a book source, an estimated 700 Hakka were killed within the first week of invasion in Dili alone. No clear numbers had been recorded since many Hakka had already escaped to neighbouring Australia. The recent re-establishment of Hakka associations in the country registered approximately 2,400 Hakka remaining, organised into some 400 families, including part-Timorese ones. The Timorese Hakka diaspora can currently be found in Darwin, Brisbane, Sydney and Melbourne in Australia; in Portugal; in Macau; and in other parts of the world in smaller numbers. They often are highly educated, and many continue their education in either Taiwan or the People's Republic of China, while a majority of the younger generation prefer to study in Australia. The Australian government took some years to assess their claims to be genuine refugees and not illegal immigrants, as partially related to the political situation in East Timor at the time. As Asian countries were neither willing to accept them as residents nor grant them political asylum to the Timorese in general, they were forced to live as stateless persons for some time. Despite this condition, many Hakka had become successful, establishing restaurant chains, shops, supermarkets, and import operations in Australia. Since the independence of East Timor in 2000, some Hakka families had returned and invested in businesses in the newborn nation. There used to be sizable Hakka communities at Tangra in Kolkata, the capital of West Bengal, and Mumbai (formerly known as Bombay). However, from the 1960s, when the Vietnam War broke out, there has been a steady migration to other countries, which accelerated in the succeeding decades. The majority moved to Canada, while others went to the United States, Australia, Taiwan, Austria and Sweden. The predominant dialect of Hakka in these communities is Meixian. It should be noted that during the time he held office in Kolkata until the late 2000s, Yap Kon Chung, the hakka ambassador for The Republic of China (Taiwan), protected and helped the Chinese residents in India. Specifically, during the Indo-Chinese war of 1962, oppression of Sino-Indian residents was escalated. Yap then made appeals to Prime Minister Nehru to bridge a bond between the Indian and Chinese people. During his office, he was also the principal at a highly regarded school as well as a political facilitator who helped many families migrate to other countries such as Canada, the United States and parts of Europe until he himself migrated to Toronto, Canada to join his family. Yap died surrounded by family on April 18, 2014, at the age of 97. Some Hakka people, notably from Taiwan, migrated to South Africa. The vast majority of Mauritian Chinese are Hakkas. Most of the Mauritian Hakkas emigrated to Mauritius in the mid-1940s came from northeastern Guangdong, especially from the Meizhou or Meixian region. As of 2008, the total population of Sino-Mauritian, consisting of Hakka and Cantonese, is around 35,000. Many Chinese people in Réunion are of Hakka origin. They either came to Réunion as indentured workers or as voluntary migrants. Hakka from all over the world have also migrated to the USA. One group is the New England Hakka Association, which reminds its members not to forget their roots. One example is a blog by Ying Han Brach called "Searching for My Hakka Roots". Another group is the Hakka Association of New York, which aims to promote Hakka culture across the five boroughs of New York City. In the mid 1970s, the Hakka Benevolent Association in San Francisco was founded by Tu Chung. The association has strong ties with the San Francisco community and offers scholarships to their young members. There are significant Hakka communities in San Francisco, San Jose, Seattle and Los Angeles. There are around 20,000 Taiwanese Hakkas in the United States. There are several Hakka communities across Canada. One group that embraces on Hakka culture in this diverse country is the Hakka Heritage Alliance. Most Chinese Jamaicans are Hakka; they have a long history in Jamaica. Between 1845 and 1884, nearly 5000 Hakkas arrived in Jamaica in three major voyages. The Hakkas seized the opportunity to venture into a new land, embracing the local language, customs and culture. During the 1960s and 1970s, substantial migration of Jamaican Hakkas to the USA and Canada have occurred. The Hakkas in Jamaica came mainly from Dongguan, Huiyang and Bao'an counties of Guangdong Province. The Chinese in Suriname are homogeneous as a group and the great majority can trace their roots to Huidong'an in Guangdong. At a 1994 seminar of the World Hakka Association held in Meixian, statistics showed that there were 6,562,429 Hakkas living abroad. In 2000, the worldwide population of Hakka was estimated at 36,059,500 and in 2010 it was estimated at 40,745,200. Another estimate is that approximately 36 million Hakka people are scattered throughout the world. More than 31 million lives in over 200 cities and counties spread throughout seven provinces of China: Guangdong, Jiangxi, Guangxi, Fujian, Hong Kong, Hunan. Hakkaology (客家學) is the academic study of the Hakka people and their culture. It encompasses their origins, identity, language, traits, architecture, customs, food, literature, history, politics, economics, diaspora and genealogical records. The study of the Hakka people first drew attention to Chinese and foreign scholars, missionaries, travellers and writers during the Taiping Heavenly Kingdom era in the middle of the nineteen century. Many wanted to know more about the Hakka people who had started the Taiping Rebellion which almost overthrew the Qing dynasty. Ernest John Eitel, a prominent German missionary, was one of those who took a great interest in this area. Theodore Hamberg, who also wrote an early English-language account of the Taiping Rebellion, is also considered a forefather of Hakka studies in the West. Many foreign scholars were full of admiration of the Hakka people. According to prominent sinologist Victor Purcell, the Hakkas "have a stubbornness of disposition that distinguishes them from their fellow Chinese". The Hakkas have had a significant influence, disproportionate to their smaller total numbers, on the course of modern Chinese and overseas Chinese history, particularly as a source of revolutionary, political and military leaders. Hakkas started and formed the backbone of the Taiping Rebellion, the largest uprising in the modern history of China. The uprising, also known as Jintian Uprising, originated at the Hakka village of Jintian in Guiping, Guangxi province. It was led by the failed Qing scholar, Hong Xiuquan, who was influenced by Protestant missionaries. Hong's charisma tapped into a consciousness of national dissent which identified with his personal interpretations of the Christian message. His following, who were initially Hakka peasants from Guangxi, grew across the southern provinces. The hugely disciplined Taiping army, which included women in their ranks, captured stoutly defended towns and cities from the Qing defenders. Four of the six top Taiping leaders are Hakkas: Hong Xiuquan, Feng Yunshan, Yang Xiuqing and Shi Dakai. In 1851, less than a year after the uprising, the Taiping Heavenly Kingdom was established. It had, at one stage, occupied one-third of China and almost toppled the Qing dynasty. Hong Rengan, the Premier of the Kingdom, was the first person in China to advocate modern-style government and opening up reforms. The kingdom lasted for thirteen years, from 1851 to 1864. Hakkas continued to play leading roles during the Xinhai Revolution that overthrew the Qing dynasty and the republican years of China. When Sun Yat-sen was small, together with other children in his village, he used to listen to an old Taiping soldier telling them stories about the heroics of the Taipings. This influenced Sun and he proclaimed that he shall be the second Hong Xiuquan. Sun was to become the Father of modern China and many of his contemporaries were his fellow Hakkas. Zheng Shiliang, a medical student and classmate of Sun, led the Huizhou Uprising (惠州起義) in 1900. Huizhou is an area in Guangdong province where most of the population are Hakkas. Deng Zhiyu led the Huizhou Qinühu Uprising (惠州七女湖起義) in 1907. All of the Four Martyrs of Honghuagang (紅花崗四烈士) are Hakkas – one of which was Wen Shengcai who assassinated the Manchu general, Fu Qi, in 1911. Brothers Hsieh Yi-qiao and Hsieh Liang-mu raised the 100,000 Chinese Yuan needed for the Huanghuagang Uprising from the overseas Chinese community in Nanyang (Southeast Asia) in 1911. At least 27 of the 85 (initially 72 because only 72 bodies could be identified) martyrs of Huanghuagang are Hakkas. Yao Yuping led the Guangdong Northern Expeditionary Force (廣東北伐軍) to successive victories against the Qing Army which were vital in the successful defence of the Provisional Government in Nanjing and the early abdication of Xuan Tong Emperor. Liao Zhongkai and Deng Keng were Sun Yat-sen's main advisors on financial and military matters respectively. A big majority of the soldiers in the Guangdong Army (粤軍) were Hakkas. Eugene Chen, whose father was a former Taiping, was an outstanding foreign minister in the 1920s. Some of the best of Nationalist China generals: Chen Mingshu, Chen Jitang, Xue Yue and Zhang Fakui amongst many others are Hakka as well. The Communist Party of China already had many Hakkas in its ranks before the outbreak of the Civil War. Li Lisan was the top leader of the party from 1928 to 1930. The Jiangxi-Fujian Soviet was the largest component territory of the Chinese Soviet Republic which was founded in 1931. It reached a peak of more than 30,000 square kilometres and a population that numbered more than three million, covering mostly Hakka areas of two provinces: Jiangxi and Fujian. The Hakka city of Ruijin was the capital of the republic. When it was overrun in 1934 by the Nationalist army in the Fifth of its Encirclement Campaigns, the Communists began their famous Long March with 86,000 soldiers, of which more than 70% were Hakkas. The Fifth Encirclement Campaign was led by Nationalist Hakka general, Xue Yue. During the retreat, the Communists managed to strike a deal with the Hakka warlord controlling Guangdong province, Chen Jitang, to let them pass through Guangdong without a fight. When the People's Liberation Army had its rank structure from 1955 to 1964, the highest number of generals, totalling 54, came from the small Hakka county of Xingguo in Jiangxi province. The county had also previously produced 27 Nationalist generals. Xingguo county is thus known as the Generals' County. During the same period, there were 132 Hakkas out of 325 generals in Jiangxi, 63 Hakkas out of 83 generals in Fujian, and 8 Hakkas out of 12 generals in Guangdong respectively, not mentioning those from Guangxi, Sichuan and Hunan. The number could have been significantly higher if the majority of the personnel who started the Long March had not perished before reaching its destination. Only less than 7,000 of the original 86,000 personnel had survived it. Prominent Hakka communist leaders include: Marshal Zhu De, the founder of the Red Army, later known as the People's Liberation Army; Ye Ting, Commander-in-chief, New Fourth Army, one of the two main Chinese communist forces fighting the Japanese Imperial Army during the Second Sino-Japanese War (the other main communist force, Eighth Route Army, was commanded by Zhu De); Marshal Ye Jianying, who led the overthrow of the Gang of Four in 1976, which marked the end of the Cultural Revolution; and Hu Yaobang, where the memorial service for his death sparked off a pro-democracy movement which led to the Tiananmen Square protests in 1989. In Guangdong, China's most prosperous province, the "Hakka clique" (客家帮) has consistently dominated the provincial government. Guangdong's Hakka governors include Ye Jianying, Ding Sheng, Ye Xuanping and Huang Huahua. Besides playing leading roles in all the three major revolutions of China, Hakkas had also been prominently involved in many of the wars against foreign intrusion of China. During the First Opium War, Lai Enjue led the Qing navy against the British at the Battle of Kowloon in 1839 and Yan Botao commanded the coastal defence at the Battle of Amoy in 1841. Feng Zicai and Liu Yongfu were instrumental in the defeat of the French at the Battle of Bang Bo which led to the French Retreat from Lạng Sơn and the conclusion of the war in 1885. During the Japanese invasion of Taiwan in 1895, the Taiwanese militia forces led by Qiu Fengjia and formed mainly by Hakkas, were able to put up a stiff resistance to the Japanese when the Qing army could not. During the Battle of Shanghai in the Second Sino-Japanese War in 1937, the heroism of Xie Jinyuan and his troops, known as the "Eight Hundred Warriors" (八百壯士) in Chinese history, gained international attention and lifted flagging Chinese morale in their successful Defence of Sihang Warehouse against the more superior Japanese Imperial Army. However, in the ensuing Battle of Nanjing, seventeen Nationalist generals were killed in action, of which six were Hakkas. During the war against the Japanese, both the commander-in-chiefs of the two main Chinese communist forces, Eighth Route Army and New Fourth Army, are Hakkas: Zhu De and Ye Ting. On the Nationalist side, Xue Yue and Zhang Fakui were commander-in-chiefs for the 9th and 4th War Zones respectively. Called the "Patton of Asia" by the West and the "God of War" (戰神) by the Chinese, Xue was China most outstanding general during the war, having won several major battles which killed hundreds of thousands of Japanese troops. Luo Zhuoying was the commander-in-chief for the 1st Route Expeditionary Forces, Burma (China's first participation of a war overseas), 1942. During the Japanese occupation of Hong Kong from 1941–1945, the Dong River Column guerrilla force (東江縱隊) was a constant harassment to the Japanese troops. The force, whose members were mostly Hakkas and led by its legendary commander, Zeng Sheng, was highly successful due to its strong Hakka network. Noteworthy accomplishments of the guerrilla force included the aiding of British and Commonwealth prisoners of war to escape successfully from Japanese internment camps and the rescuing of twenty American pilots who parachuted into Hong Kong when they were shot down. Since the Xinhai Revolution, Meizhou alone which consisted of 7 Hakka counties has produced 474 generals (there are more than 200 Hakka or partial-Hakka counties in China). According to some books, the Soong family from which the Soong Sisters had been influential figures during the Republican period, has been cited to have Hakka ancestors. In the book, "My father Deng Xiaoping" (我的父亲邓小平), by China paramount leader Deng Xiaoping's daughter, Deng Rong, she had mentioned that the Deng family's ancestry is possibly Hakka, but not definitely. Overseas Hakkas have also been prominent politically in the countries they had migrated to, many of which are leading political figures of the countries or the Chinese communities there. Since the 20th century, there have been twenty Hakkas who had become heads of state or heads of government in different countries. The Guest People (Chinese: 客家之歌), a 1997 30-episode Singapore television drama about four young Hakka men who migrated from China to Singapore in the 1950s and were caught in the tumultuous anti-colonial period of the country's history. The Hakka language version of the drama was broadcast in Taiwan. The drama was nominated for the Best Drama Series awards in the Asian Television Awards and the New York Television Festival, 1998. 1895 or Blue Brave: The Legend of Formosa 1895 (Chinese: 1895乙未), a 2008 Taiwan Hakka language film about the Hakka militias fighting the Japanese during the Japanese invasion of Taiwan in 1895. The edited version for television won the Best Drama Series award in the Asian Television Awards, 2009. (Chinese: 滚滚血脉 or 填四川), a 2009 29-episode China-Taiwan television drama about a Hakka family spanning 300 years, with the Hakkas' migration from Guangdong to Sichuan during the Great Migration Wave to Sichuan (湖广填四川) as backdrop. The Hakka language version of the drama, titled One Hundred Thousand Miles Away from Home (Chinese: 离家十万里), was broadcast in Taiwan. Down To Nanyang (Chinese: 下南洋), a 2011 40-episode China television drama about Fujian Yongding Hakkas' migration to Nanyang (Southeast Asia) during the late Qing dynasty and early Republican era, and their involvement as overseas Chinese in the revolution to overthrow the Qing government. The theme song of the drama is in the Hakka language. The Great Southern Migration (Chinese: 大南迁 or 葛藤凹), a 2012 32-episode China television drama about the Hakkas' migration to Southern China during the late Tang dynasty in the 9th century. Hakka Women (Chinese: 客家女人) or To Be or Not to Be (Chinese: 来生不做香港人), a 2014 25-episode Hong Kong television drama about the lives of two Hakka sisters separated when young, one in Hong Kong and the other in China. Char, Tin-yuke (1969). The Hakka Chinese – Their Origin & Folk Songs. Jade Mountain Press. Eberhard, Wolfram (1974). Studies in Hakka Folktales. Taipei: Chinese Association for Folklore. Kiang, Clyde (July 1991). The Hakka Search for a Homeland. Allegheny Press. ISBN 9780910042611. Constable, Nicole, ed. (1996). Guest People: Hakka Identity in China and Abroad. University of Washington Press. ISBN 9780295984872. Leong, Sow-Theng (1997). Wright, Tim (ed.). Migration and Ethnicity in Chinese History: Hakkas, Pengmin and Their Neighbors. Stanford University Press. ISBN 9780804728577. Chung, Yoon-Ngan (2005). The Hakka Chinese: Their Origin, Folk Songs and Nursery Rhymes. Poseidon Books. ISBN 978-1921005503. Leo, Jessieca (September 2015). Global Hakka: Hakka Identity in the Remaking. BRILL. ISBN 9789004300262. Erbaugh, Mary S. (December 1992). "The Secret History of the Hakkas: The Chinese Revolution as a Hakka Enterprise". The China Quarterly (132): 937–968. JSTOR 654189. Spence, Jonathan D. (December 1996). God's Chinese Son: The Taiping Heavenly Kingdom of Hong Xiuquan. W. W. Norton & Company. ISBN 9780393315561. Zhang, Delai (2002). The Hakkas of Sabah: A Survey of Their Impact on the Modernization of the Bornean Malaysian State. Sabah Theological Seminary. ISBN 9789834084004. Yong, Kee Howe (July 2013). The Hakkas of Sarawak: Sacrificial Gifts in Cold War Era Malaysia. University of Toronto Press. ISBN 9781442615465. Lee, Wei Ling (January 2015). Yap, Koon Hong (ed.). A Hakka Woman's Singapore Stories: My Life as a Daughter, Doctor and Diehard Singaporean. Straits Times Press. ISBN 9789814642477. Liu, L. Larry (January 2015). Hakkas in Power: A Study of Chinese Political Leadership in East and Southeast Asia, and South America. Create Space Independent Publishing Platform. ISBN 9781505429435. Lee, T.H. (1955). Hakka Lessons for Malayan Students. Government Federation of Malaya. Tsang, Joseph Mang Kin (January 2003). The Hakka Epic. President's Fund for Creative Writing in English. ISBN 9789990397406. Chen, Matthew Y.; Lian, Hee Wee; Yan, Xiuhong (2004). The Paradox of Hakka Tone Sandhi. Dept of Chinese Studies, National University of Singapore. ISBN 9789810519438. Hashimoto, Mantaro J. (June 2010). The Hakka Dialect: A Linguistic Study of its Phonology, Syntax and Lexicon. Cambridge University Press. ISBN 9780521133678. Constable, Nicole (August 1994). Christian Souls and Chinese Spirits: A Hakka Community in Hong Kong. University of California Press. ISBN 9780520083844. Lutz, Jessie G.; Lutz, Rolland Ray (January 1998). Hakka Chinese Confront Protestant Christianity, 1850-1900: With the Autobiographies of Eight Hakka Christians, and Commentary. Routledge. ISBN 9780765600387. Christofferson, Ethan (September 2012). Negotiating Identity: Exploring Tensions between Being Hakka and Being Christian in Northwestern Taiwan. Wipf & Stock Publishers. ISBN 9781610975032. Anusasananan, Linda Lau (October 2012). The Hakka Cookbook: Chinese Soul Food from around the World. University of California Press. ISBN 9780520273283. Tan, Amy (October 1995). The Hundred Secret Senses. Penguin Books. ISBN 9780399141157. The book was shortlisted for the 1996 Orange Prize for Fiction. Lee, J.P. (January 2004). Breaking the Curse of the Green Dragon (A Hakka Story). Instrument of Truth. ISBN 9789810480424. Chin, Woon Ping (June 2008). Hakka Soul: Memories, Migrations and Meals. University of Hawaii. ISBN 9780824832896. Huang, Suhua (April 2012). A Faithful Reading Partner: A Story from a Hakka Village. AuthorHouse. ISBN 9781468562675. Lampotang, Peggy (January 2014). The Coral Heart: A Shopkeeper's Journey. Atelier d'ecriture. ISBN 9789990336924. Sze, Elsie (February 2014). Ghost Cave: A Novel of Sarawak. Hong Kong Women in Publishing Society. ISBN 978-1496073945. Hsiung, C. Fong (September 2014). Picture Bride. Mawenzi House/TSAR Publishers. ISBN 9781927494394. Lin Ung, Charlene (March 2015). Nam Moi: A Young Girl's Story of Her Family's Escape from Vietnam. Createspace Independent Publishing Platform. ISBN 9781508700791. ^ a b "Hakka population". Encyclopædia Britannica. Retrieved 15 January 2015. ^ "客家文化探密：怀念先人 感念生活 客家人闹元宵". Sina Corp.
^ "Hakka culture GuangdongCulture". Newsgd.com. Retrieved 15 January 2015. ^ LaCroix, Frederick E. (2009). The sky rained heroes: A journey from war to remembrance. Austin: Synergy Books. p. 56. ISBN 978-0-9821601-3-8. ^ a b c "The Hakka : The Jews of Asia". Edu.ocac.gov.tw. Retrieved 15 January 2015. ^ "Welcome to Longyan Municipal People's Government, PRC". English.longyan.gov.cn. Retrieved 15 January 2015. ^ Erbaugh, Mary S. (December 1992). "The Secret History of the Hakkas: The Chinese Revolution as a Hakka Enterprise". The China Quarterly (132): 937–968. JSTOR 654189. ^ "Hakka made an official language". ^ "The Hakka People". 全球華文網路教育中心. ^ Kuo, Huei-Ying. Networks beyond Empires: Chinese Business and Nationalism in the Hong Kong …. ^ a b c Chen, Jieming; Zheng, Houfeng; Bei, Jin-Xin; Sun, Liangdan; Jia, Wei-hua; Li, Tao; Zhang, Furen; Seielstad, Mark; Zeng, Yi-Xin; Zhang, Xuejun; Liu, Jianjun (1 December 2009). "Genetic Structure of the Han Chinese Population Revealed by Genome-wide SNP Variation". The American Journal of Human Genetics. 85 (6): 775–785. doi:10.1016/j.ajhg.2009.10.016. PMC 2790583. PMID 19944401. ^ Constable, Nicole (2005). Guest People : Hakka Identity in China and Abroad. Seattle: Univ. of Washington Press. p. 9. ISBN 9780295984872. ^ a b Hu, SP; Luan, JA; Li, B; Chen, JX; Cai, KL; Huang, LQ; Xu, XY (January 2007). "Genetic link between Chaoshan and other Chinese Han populations: Evidence from HLA-A and HLA-B allele frequency distribution". American Journal of Physical Anthropology. 132 (1): 140–50. doi:10.1002/ajpa.20460. PMID 16883565. ^ a b c d e Wang, WZ; Wang, CY; Cheng, YT; Xu, AL; Zhu, CL; Wu, SF; Kong, QP; Zhang, YP (January 2010). "Tracing the origins of Hakka and Chaoshanese by mitochondrial DNA analysis". American Journal of Physical Anthropology. 141 (1): 124–30. doi:10.1002/ajpa.21124. PMID 19591216. ^ "Related Topics: Non-legal Considerations: Language". Taiwandocuments.org. Retrieved 15 January 2015. ^ Cheung, Sidney C.H. (1998). On the south China track: Perspectives on anthropological research and teaching. Hong Kong: Hong Kong Institute of Asia-Pacific Studies, Chinese University of Hong Kong. p. 160. ISBN 978-962-441-540-7. ^ Choon, Yoon Ngan (2005). The Hakka Chinese: Their Origin, Folk Songs And Nursery Rhymes. BURLEIGH MDC QLD. 4220, AUSTRALIA: Poseidon Books. ISBN 978-1-921005-50-3. ^ a b Lee, Khoon Choy (2006). Pioneers of modern China : understanding the inscrutable Chinese. River Edge, New Jersey: World Scientific Publishing. p. 62. ISBN 9789812566188. ^ Native Place, City, and Nation: Regional Networks and Identities in Shanghai, 1853–1937. p. 80. ^ Kuiper, Koos (P.N) (2017-07-17). The early Dutch sinologists (1854-1900) : training in Holland and China, functions in the Netherlands Indies. p. 573. ISBN 9789004339637. ^ UNESCO World Heritage Centre. "Fujian Tulou – UNESCO World Heritage Centre". Whc.unesco.org. Retrieved 15 January 2015. ^ a b Davis, Edward L. (2005). Encyclopedia of Contemporary Chinese Culture. London: Routledge. p. 333. ISBN 9780415241298. ^ Lozada, Eriberto (2005). Ember, Carol R.; Ember, Melvin; Skoggard, Ian (eds.). Encyclopedia of Diasporas: Immigrant and Refugee Cultures Around the World. 2. Dordrecht, Netherlands: Springer Science & Business Media. pp. 92–103. ISBN 9780306483219. ^ "Townsmen Sentiment Always Serves as a Link". ^ "Ganzhou.China". Gndaily.com. Retrieved 15 January 2015. ^ Yingcong Dai (2009). The Sichuan Frontier and Tibet: Imperial Strategy in the Early Qing. University of Washington Press. pp. 25–. ISBN 978-0-295-98952-5. ^ "维基文库，自由的图书馆". Zh.wikisource.org. Retrieved 15 January 2015. ^ New Peace County, A Chinese Gazetteer of the Hong Kong Region Peter Y.L. Ng, Hong Kong University Press, 1983. ISBN 962-209-043-5. ^ Ng (1983), p. 84. ^ a b Hase, Patrick (1995). "Alliance of Ten". In Faure, David; Siu, Helen (eds.). Down to Earth : The Territorial Bond in South China. Stanford, California: Stanford Univ. Press. pp. 123–160. ISBN 978-0-8047-2434-0. OCLC 31815055. ^ "About the Hakka people in Taiwan". HakkaTV. Public Television Service. 2012-10-05. Retrieved 4 February 2015. ^ Davidson, James W. (1903). The Island of Formosa, Past and Present : history, people, resources, and commercial prospects : tea, camphor, sugar, gold, coal, sulphur, economical plants, and other productions. London and New York: Macmillan. p. 561. OCLC 1887893. OL 6931635M. ^ Davidson (1903), p. 590. ^ Tsai 2009, p. 97. ^ Joshua Project. "People Groups". joshuaproject.net. ^ a b c Jessieca Leo (2015-09-03). Global Hakka: Hakka Identity in the Remaking. Brill. p. 87. ISBN 9789004300279. ^ Chong, Tet Loi (2002). The Hakkas of Sabah : a survey of their impact on the modernization of the Bornean Malaysian State. Sabah Theological Seminary. pp. 32–33. ^ Jessieca Leo (2015-09-03). Global Hakka: Hakka Identity in the Remaking. Brill. pp. 75–76. ISBN 9789004300279. ^ Chong, Tet Loi (2002). The Hakkas of Sabah: A Survey on Their Impact on the Modernization of the Bornean Malaysian State. Kota Kinabalu: Sabah Theological Seminary. p. 28. ISBN 978-983-40840-0-4. OCLC 51876445. ^ Lamb, Kate (9 May 2017). "Jakarta governor Ahok sentenced to two years in prison for blasphemy". The Guardian. ^ "Kebersamaan Tanpa Prasangka". KOMPAS. August 23, 2006. Retrieved September 10, 2007. ^ "United Singkawang – Bahasa Hakka di Singkawang". Singkawang.us. Archived from the original on 8 May 2015. Retrieved 15 January 2015. ^ a b Thunø, Mette (2007). Beyond Chinatown: new Chinese migration and the global expansion of China. NIAS Press. p. 234. ISBN 978-87-7694-000-3. OL 13426825M. Retrieved 2009-11-24. ^ Ying Han Brach. "Searching For My Hakka Roots". Myhakka. Retrieved 15 January 2015. ^ Lai, Him Mark. Becoming Chinese American: A History of Communities and Institutions. p. 245. ^ Hattaway, Paul (2004). Peoples of the Buddhist World: A Christian Prayer Diary. Carlisle: Piquant. ISBN 9780878083619. ^ "Home for Hakka group opens". ^ "The Malaysian Chinese population is decreasing". ^ Lee, Pui-tak (2005-09-01). Colonial Hong Kong and Modern China: Interaction and Reintegration. ISBN 9789622097209. ^ Spence, Jonathan D. (1997). God's Chinese son : the Taiping Heavenly Kingdom of Hong Xiuquan. New York: W.W. Norton. ISBN 9780393315561. ^ "Dr. Sun Yat-sen – Chinese Cultural Plaza – Honolulu, HI – Statues of Historic Figures on Waymarking.com". Waymarking.com. Retrieved 15 January 2015. ^ "An Overseas Chinese martyr". Asiawind.com. Retrieved 15 January 2015. ^ "黄花岗起义革命志士后人讲述："会计部长"筹资十万促" (in Chinese). Ido.3mt.com.cn. Retrieved 15 January 2015. ^ "Yao Yuping and the Xinhai Revolution" (in Chinese). Homemy.jumzsf.come. 8 April 2013. ^ 5. "5". Renwuzhuanjiwang.com. Retrieved 15 January 2015. ^ "中华战神薛岳—抗战中歼灭日寇最多的中国将领/第三次长沙会战的胜利之神_林育容元帅_新浪博客" (in Chinese). Blog.sina.com. Retrieved 15 January 2015. ^ "The Secret History of the Hakkas: The Chinese Revolution as a Hakka Enterprise" (PDF). ^ Discuz! Team and Comsenz UI Team. "֮_̳__˵". Suizhou.org. Archived from the original on March 9, 2012. Retrieved 15 January 2015. ^ "East River Column". JSTOR j.ctt1xwfs6. ^ "Secret History: The Soong Sisters real surname" (in Chinese). Xinhua News Agency. 17 October 2010. Archived from the original on 12 June 2011. ^ "Hakka Chinese Political Leadership in East and Southeast Asia, and South America". ^ "朱德的祖籍家世". Archived from the original on 2014-10-09. ^ "李登辉助选新招：客家人厉害 连战很客气". Archived from the original on 2015-04-02. ^ "前副總統李元簇是湖南省平江縣的客家人". Archived from the original on 2016-03-04. ^ "与王升的一面之缘". Archived from the original on 2016-03-04. ^ "江宜樺盼發揚客語 促客家新都". Archived from the original on 2015-09-04. ^ "Riot Survivor Ready to Become First Chinese Jakarta Governor". ^ "Basuki Ahok Purnama Sworn in as Jakarta Governor". ^ "Sok An". Archived from the original on 2016-03-06. ^ Choy, Lee Khoon (2013-03-26). Golden Dragon and Purple Phoenix: The Chinese and Their Multi-Ethnic Descendants in Southeast Asia. ISBN 9789814518499. ^ "Penny Wong – when grit and talent triumph over hypocrisy, racism". ^ "There is a saying, in Hakka, When everyone collects firewood, the flames rise high". ^ "33岁华人新贵——韦鸣恩". Archived from the original on 2014-10-16. ^ "Tsai touting her Hakka credentials on campaign tour". ^ "Pa's security staff went beyond call of duty". ^ "Chinese community honoured with road name Kampung Hakka's Last Walk". ^ "A VILLAGE FIGHTS FOR SURVIVAL – THE KAMPUNG HAKKA SAGA". ^ "After surviving 120 years, Kampung Hakka may fall to modern times". ^ "Kampung Hakka's Last Walk". ^ "Orange past winners". Retrieved 2008-05-11.